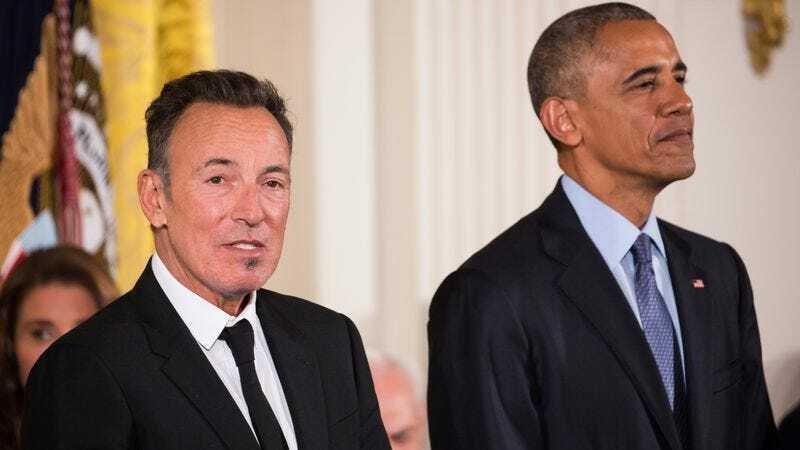 Long-time Barack Obama supporter Bruce Springsteen made one last gesture of solidarity with America’s outgoing president last week, with Backstreets reporting that Springsteen played a private concert in the White House’s East Room for Obama and his staff on January 12. The event occurred just a few days after the president awarded Springsteen the Presidential Medal Of Freedom, the highest civilian honor in the United States, at a ceremony in the same room. And, rather than just tossing off his greatest hits, The Boss pulled out all the stops, playing a thematic, politically charged playlist that ranged from staples like “Born In The U.S.A.”—a protest song, Springsteen noted, that’s been misinterpreted in the past, and would likely be misinterpreted again—to more nostalgic fare like “My Hometown” and “Long Walk Home.” Springsteen ultimately played 15 songs that night, with Patti Scialfa joining in on “Tougher Than the Rest” and “If I Should Fall Behind”. Springsteen closed out the night—described as “elegiac” by the White House staffer who wrote it up for Backstreets—with “Dancing In The Dark” and “Land Of Hope And Dreams,” the song President Obama exited to after his farewell address to the nation on January 10.